When it comes to cut flowers, the poppy may be the ‘Internet darling’ of the moment. Featured on hip wedding sites and lifestyle blogs, arranged in mason jars and in hand-tied bouquets at flower farms and appearing on stands at farmers’ markets, the poppy attracts the hip and stylish with their vintage, casual feel and beautiful colours. 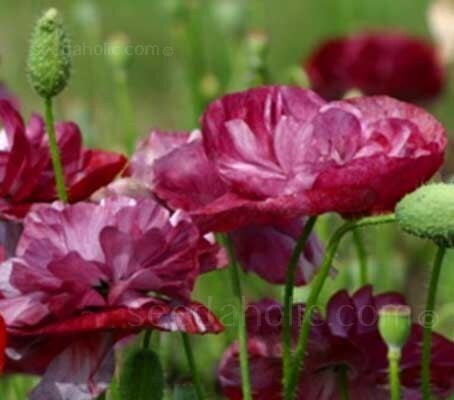 Papaver rhoeas 'Pandora' is a strikingly unique and impressive new variety, which blooms in a phenomenal combination of shades. From voluptuous deep burgundy red to paler pink-red all broken by silver grey stripes on the lower petals. Simply surface sow the seed in a sunny garden bed in early autumn or spring. The slender wiry stems rise above the rosettes of foliage from early summer and bloom for several months. Dead head any faded blooms for an extended floral extravaganza. They grow to a height of 60cm (24in) and a spread of 40cm (16in). At their best when planted in large drifts, they also make wonderful, if somewhat short-lived cut flowers. Sowing: Direct sow in spring or in autumn. Seeds germinate in less than two weeks. The seedlings will appear in rows approx 6 to 8 weeks after planting and can be told from nearby weed seedlings quite easily. Thin the seedlings out so they are finally 4 to 6 in apart by early summer. Alternatively, leave them to grow as small clumps, of 4 to 6 plants every 30cm (12in) or so. Compost should be kept slightly moist, but not wet at all times. Prefers well drained soil enriched with manure or compost ahead of planting. Feeding is rarely needed but water well if there are prolonged periods of drought. Cut when flowers are in bud, hold the base of the stems for a few seconds in a flame or boiling water, and the flowers will last several days in water. 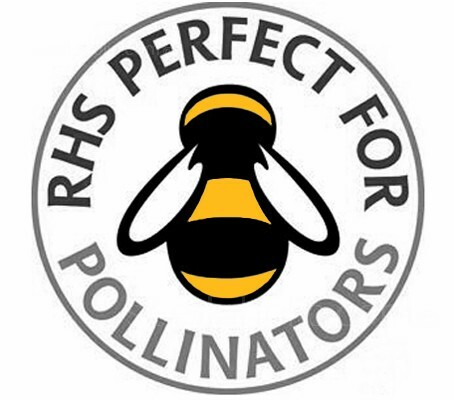 Cottage/Informal Garden, Flower Borders and Beds, Wildflower meadows, Butterfly & Bee Gardens, Cut Flowers. 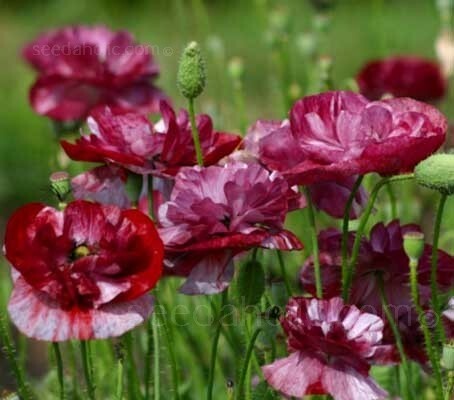 The origin of Papaver rhoeas is not known for certain. As with many such plants, the area of origin is often ascribed by Americans to Europe, and by northern Europeans to southern Europe. The European Garden Flora suggests that it is ‘Eurasia and North Africa’; in other words, the lands where agriculture has been practiced since the earliest times. It was probably introduced into Britain and Ireland along with agricultural crops at least as far back as the Late Bronze Age. It has had an old symbolism and association with agricultural fertility. Common poppy is found on a wide range of soils but is most frequent on light, calcareous soils. It is a species of flowering plant in the poppy family, Papaveraceae and is pollinated by insects, particularly bumble bees. The species name rhoeas is probably derived from the Latin word 'rho' meaning red. The variety name Pandora derives from the Greek pān meaning 'all' and dōron meaning 'gift', thus 'the all-endowed' or 'the all-gifted', however, more properly Pandora means 'all-giving'. In ancient Greek mythology, Pandora was the first mortal woman, made by Hephaestus and given as a bride to Epimetheus. Pandora's box refers to her gift from Zeus, which was foolishly opened by Epimetheus, upon which all the contents escaped. They were said to be the host of human ills, escaping to afflict mankind, or, in a later version, all the blessings of the god escaping to be lost, except Hope, which alone remained inside once she had closed the box again. West or South facing. Sheltered. Direct sow from early spring or in autumn.